For an introduction to concepts and terminology used in this article, see Chemical synapse. Neurotransmitters are endogenous chemicals that enable neurotransmission. It is a type of chemical messenger which transmits signals across a chemical synapse, such as a neuromuscular junction, from one neuron (nerve cell) to another "target" neuron, muscle cell, or gland cell. Neurotransmitters are released from synaptic vesicles in synapses into the synaptic cleft, where they are received by neurotransmitter receptors on the target cells. Many neurotransmitters are synthesized from simple and plentiful precursors such as amino acids, which are readily available from the diet and only require a small number of biosynthetic steps for conversion. Neurotransmitters play a major role in shaping everyday life and functions. Their exact numbers are unknown, but more than 200 chemical messengers have been uniquely identified. Neurotransmitters are stored in synaptic vesicles, clustered close to the cell membrane at the axon terminal of the presynaptic neuron. Neurotransmitters are released into and diffuse across the synaptic cleft, where they bind to specific receptors on the membrane of the postsynaptic neuron. Most neurotransmitters are about the size of a single amino acid; however, some neurotransmitters may be the size of larger proteins or peptides. A released neurotransmitter is typically available in the synaptic cleft for a short time before it is metabolized by enzymes, pulled back into the presynaptic neuron through reuptake, or bound to a postsynaptic receptor. Nevertheless, short-term exposure of the receptor to a neurotransmitter is typically sufficient for causing a postsynaptic response by way of synaptic transmission. In response to a threshold action potential or graded electrical potential, a neurotransmitter is released at the presynaptic terminal. Low level "baseline" release also occurs without electrical stimulation. The released neurotransmitter may then move across the synapse to be detected by and bind with receptors in the postsynaptic neuron. Binding of neurotransmitters may influence the postsynaptic neuron in either an inhibitory or excitatory way. This neuron may be connected to many more neurons, and if the total of excitatory influences are greater than those of inhibitory influences, the neuron will also "fire". Ultimately it will create a new action potential at its axon hillock to release neurotransmitters and pass on the information to yet another neighboring neuron. Until the early 20th century, scientists assumed that the majority of synaptic communication in the brain was electrical. However, through the careful histological examinations by Ramón y Cajal (1852–1934), a 20 to 40 nm gap between neurons, known today as the synaptic cleft, was discovered. The presence of such a gap suggested communication via chemical messengers traversing the synaptic cleft, and in 1921 German pharmacologist Otto Loewi (1873–1961) confirmed that neurons can communicate by releasing chemicals. Through a series of experiments involving the vagus nerves of frogs, Loewi was able to manually slow the heart rate of frogs by controlling the amount of saline solution present around the vagus nerve. Upon completion of this experiment, Loewi asserted that sympathetic regulation of cardiac function can be mediated through changes in chemical concentrations. Furthermore, Otto Loewi is credited with discovering acetylcholine (ACh)—the first known neurotransmitter. Some neurons do, however, communicate via electrical synapses through the use of gap junctions, which allow specific ions to pass directly from one cell to another. The chemical must be synthesized in the neuron or otherwise be present in it. When the neuron is active, the chemical must be released and produce a response in some target. The same response must be obtained when the chemical is experimentally placed on the target. A mechanism must exist for removing the chemical from its site of activation after its work is done. Carry messages between neurons via influence on the postsynaptic membrane. Have little or no effect on membrane voltage, but have a common carrying function such as changing the structure of the synapse. Communicate by sending reverse-direction messages that affect the release or reuptake of transmitters. The anatomical localization of neurotransmitters is typically determined using immunocytochemical techniques, which identify the location of either the transmitter substances themselves, or of the enzymes that are involved in their synthesis. Immunocytochemical techniques have also revealed that many transmitters, particularly the neuropeptides, are co-localized, that is, one neuron may release more than one transmitter from its synaptic terminal. Various techniques and experiments such as staining, stimulating, and collecting can be used to identify neurotransmitters throughout the central nervous system. There are many different ways to classify neurotransmitters. Dividing them into amino acids, peptides, and monoamines is sufficient for some classification purposes. Trace amines: phenethylamine, N-methylphenethylamine, tyramine, 3-iodothyronamine, octopamine, tryptamine, etc. Others: acetylcholine (ACh), anandamide, etc. In addition, over 50 neuroactive peptides have been found, and new ones are discovered regularly. Many of these are "co-released" along with a small-molecule transmitter. Nevertheless, in some cases a peptide is the primary transmitter at a synapse. β-endorphin is a relatively well-known example of a peptide neurotransmitter because it engages in highly specific interactions with opioid receptors in the central nervous system. Single ions (such as synaptically released zinc) are also considered neurotransmitters by some, as well as some gaseous molecules such as nitric oxide (NO), carbon monoxide (CO), and hydrogen sulfide (H2S). The gases are produced in the neural cytoplasm and are immediately diffused through the cell membrane into the extracellular fluid and into nearby cells to stimulate production of second messengers. Soluble gas neurotransmitters are difficult to study, as they act rapidly and are immediately broken down, existing for only a few seconds. The most prevalent transmitter is glutamate, which is excitatory at well over 90% of the synapses in the human brain. The next most prevalent is Gamma-Aminobutyric Acid, or GABA, which is inhibitory at more than 90% of the synapses that do not use glutamate. Although other transmitters are used in fewer synapses, they may be very important functionally: the great majority of psychoactive drugs exert their effects by altering the actions of some neurotransmitter systems, often acting through transmitters other than glutamate or GABA. Addictive drugs such as cocaine and amphetamines exert their effects primarily on the dopamine system. The addictive opiate drugs exert their effects primarily as functional analogs of opioid peptides, which, in turn, regulate dopamine levels. Neurons form elaborate networks through which nerve impulses—action potentials—travel. Each neuron has as many as 15,000 connections with neighboring neurons. Neurons do not touch each other (except in the case of an electrical synapse through a gap junction); instead, neurons interact at contact points called synapses: a junction within two nerve cells, consisting of a miniature gap within which impulses are carried by a neurotransmitter. A neuron transports its information by way of a nerve impulse called an action potential. When an action potential arrives at the synapse's presynaptic terminal button, it may stimulate the release of neurotransmitters. These neurotransmitters are released into the synaptic cleft to bind onto the receptors of the postsynaptic membrane and influence another cell, either in an inhibitory or excitatory way. The next neuron may be connected to many more neurons, and if the total of excitatory influences minus inhibitory influences is great enough, it will also "fire". That is to say, it will create a new action potential at its axon hillock, releasing neurotransmitters and passing on the information to yet another neighboring neuron. A neurotransmitter can influence the function of a neuron through a remarkable number of mechanisms. In its direct actions in influencing a neuron's electrical excitability, however, a neurotransmitter acts in only one of two ways: excitatory or inhibitory. A neurotransmitter influences trans-membrane ion flow either to increase (excitatory) or to decrease (inhibitory) the probability that the cell with which it comes in contact will produce an action potential. Thus, despite the wide variety of synapses, they all convey messages of only these two types, and they are labeled as such. Type I synapses are excitatory in their actions, whereas type II synapses are inhibitory. Each type has a different appearance and is located on different parts of the neurons under its influence. Type I (excitatory) synapses are typically located on the shafts or the spines of dendrites, whereas type II (inhibitory) synapses are typically located on a cell body. In addition, Type I synapses have round synaptic vesicles, whereas the vesicles of type II synapses are flattened. The material on the presynaptic and post-synaptic membranes is denser in a Type I synapse than it is in a type II, and the type I synaptic cleft is wider. Finally, the active zone on a Type I synapse is larger than that on a Type II synapse. The different locations of type I and type II synapses divide a neuron into two zones: an excitatory dendritic tree and an inhibitory cell body. From an inhibitory perspective, excitation comes in over the dendrites and spreads to the axon hillock to trigger an action potential. If the message is to be stopped, it is best stopped by applying inhibition on the cell body, close to the axon hillock where the action potential originates. Another way to conceptualize excitatory–inhibitory interaction is to picture excitation overcoming inhibition. If the cell body is normally in an inhibited state, the only way to generate an action potential at the axon hillock is to reduce the cell body's inhibition. In this "open the gates" strategy, the excitatory message is like a racehorse ready to run down the track, but first the inhibitory starting gate must be removed. As explained above, the only direct action of a neurotransmitter is to activate a receptor. Therefore, the effects of a neurotransmitter system depend on the connections of the neurons that use the transmitter, and the chemical properties of the receptors that the transmitter binds to. Glutamate is used at the great majority of fast excitatory synapses in the brain and spinal cord. It is also used at most synapses that are "modifiable", i.e. capable of increasing or decreasing in strength. Modifiable synapses are thought to be the main memory-storage elements in the brain. Excessive glutamate release can overstimulate the brain and lead to excitotoxicity causing cell death resulting in seizures or strokes. Excitotoxicity has been implicated in certain chronic diseases including ischemic stroke, epilepsy, amyotrophic lateral sclerosis, Alzheimer's disease, Huntington disease, and Parkinson's disease. GABA is used at the great majority of fast inhibitory synapses in virtually every part of the brain. Many sedative/tranquilizing drugs act by enhancing the effects of GABA. Correspondingly, glycine is the inhibitory transmitter in the spinal cord. Acetylcholine was the first neurotransmitter discovered in the peripheral and central nervous systems. It activates skeletal muscles in the somatic nervous system and may either excite or inhibit internal organs in the autonomic system. It is distinguished as the transmitter at the neuromuscular junction connecting motor nerves to muscles. The paralytic arrow-poison curare acts by blocking transmission at these synapses. Acetylcholine also operates in many regions of the brain, but using different types of receptors, including nicotinic and muscarinic receptors. Dopamine has a number of important functions in the brain; this includes regulation of motor behavior, pleasures related to motivation and also emotional arousal. It plays a critical role in the reward system; Parkinson's disease has been linked to low levels of dopamine and schizophrenia has been linked to high levels of dopamine. Serotonin is a monoamine neurotransmitter. Most is produced by and found in the intestine (approximately 90%), and the remainder in central nervous system neurons. It functions to regulate appetite, sleep, memory and learning, temperature, mood, behaviour, muscle contraction, and function of the cardiovascular system and endocrine system. It is speculated to have a role in depression, as some depressed patients are seen to have lower concentrations of metabolites of serotonin in their cerebrospinal fluid and brain tissue. Norepinephrine which is synthesized in the central nervous system and sympathetic nerves, modulates the responses of the autonomic nervous system, the sleep patterns, focus and alertness. It is synthesized from tyrosine. Epinephrine which is also synthesized from tyrosine is released in the adrenal glands and the brainstem. It plays a role in sleep, with ones ability to become and stay alert, and the fight-or-flight response. Histamine works with the central nervous system (CNS), specifically the hypothalamus (tuberomammillary nucleus) and CNS mast cells. Drugs can influence behavior by altering neurotransmitter activity. For instance, drugs can decrease the rate of synthesis of neurotransmitters by affecting the synthetic enzyme(s) for that neurotransmitter. When neurotransmitter syntheses are blocked, the amount of neurotransmitters available for release becomes substantially lower, resulting in a decrease in neurotransmitter activity. Some drugs block or stimulate the release of specific neurotransmitters. Alternatively, drugs can prevent neurotransmitter storage in synaptic vesicles by causing the synaptic vesicle membranes to leak. Drugs that prevent a neurotransmitter from binding to its receptor are called receptor antagonists. For example, drugs used to treat patients with schizophrenia such as haloperidol, chlorpromazine, and clozapine are antagonists at receptors in the brain for dopamine. Other drugs act by binding to a receptor and mimicking the normal neurotransmitter. Such drugs are called receptor agonists. An example of a receptor agonist is morphine, an opiate that mimics effects of the endogenous neurotransmitter β-endorphin to relieve pain. Other drugs interfere with the deactivation of a neurotransmitter after it has been released, thereby prolonging the action of a neurotransmitter. This can be accomplished by blocking re-uptake or inhibiting degradative enzymes. Lastly, drugs can also prevent an action potential from occurring, blocking neuronal activity throughout the central and peripheral nervous system. Drugs such as tetrodotoxin that block neural activity are typically lethal. Drugs targeting the neurotransmitter of major systems affect the whole system, which can explain the complexity of action of some drugs. Cocaine, for example, blocks the re-uptake of dopamine back into the presynaptic neuron, leaving the neurotransmitter molecules in the synaptic gap for an extended period of time. Since the dopamine remains in the synapse longer, the neurotransmitter continues to bind to the receptors on the postsynaptic neuron, eliciting a pleasurable emotional response. Physical addiction to cocaine may result from prolonged exposure to excess dopamine in the synapses, which leads to the downregulation of some post-synaptic receptors. 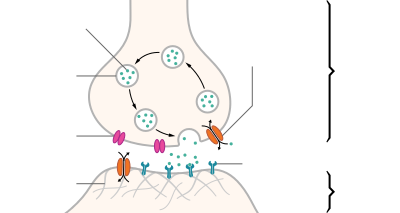 After the effects of the drug wear off, an individual can become depressed due to decreased probability of the neurotransmitter binding to a receptor. Fluoxetine is a selective serotonin re-uptake inhibitor (SSRI), which blocks re-uptake of serotonin by the presynaptic cell which increases the amount of serotonin present at the synapse and furthermore allows it to remain there longer, providing potential for the effect of naturally released serotonin. AMPT prevents the conversion of tyrosine to L-DOPA, the precursor to dopamine; reserpine prevents dopamine storage within vesicles; and deprenyl inhibits monoamine oxidase (MAO)-B and thus increases dopamine levels. An agonist is a chemical capable of binding to a receptor, such as a neurotransmitter receptor, and initiating the same reaction typically produced by the binding of the endogenous substance. An agonist of a neurotransmitter will thus initiate the same receptor response as the transmitter. In neurons, an agonist drug may activate neurotransmitter receptors either directly or indirectly. Direct-binding agonists can be further characterized as full agonists, partial agonists, inverse agonists. Direct agonists act similar to a neurotransmitter by binding directly to its associated receptor site(s), which may be located on the presynaptic neuron or postsynaptic neuron, or both. Typically, neurotransmitter receptors are located on the postsynaptic neuron, while neurotransmitter autoreceptors are located on the presynaptic neuron, as is the case for monoamine neurotransmitters; in some cases, a neurotransmitter utilizes retrograde neurotransmission, a type of feedback signaling in neurons where the neurotransmitter is released postsynaptically and binds to target receptors located on the presynaptic neuron. [note 1] Nicotine, a compound found in tobacco, is a direct agonist of most nicotinic acetylcholine receptors, mainly located in cholinergic neurons. Opiates, such as morphine, heroin, hydrocodone, oxycodone, codeine, and methadone, are μ-opioid receptor agonists; this action mediates their euphoriant and pain relieving properties. Indirect agonists increase the binding of neurotransmitters at their target receptors by stimulating the release or preventing the reuptake of neurotransmitters. Some indirect agonists trigger neurotransmitter release and prevent neurotransmitter reuptake. Amphetamine, for example, is an indirect agonist of postsynaptic dopamine, norepinephrine, and serotonin receptors in each their respective neurons; it produces both neurotransmitter release into the presynaptic neuron and subsequently the synaptic cleft and prevents their reuptake from the synaptic cleft by activating TAAR1, a presynaptic G protein-coupled receptor, and binding to a site on VMAT2, a type of monoamine transporter located on synaptic vesicles within monoamine neurons. An antagonist is a chemical that acts within the body to reduce the physiological activity of another chemical substance (as an opiate); especially one that opposes the action on the nervous system of a drug or a substance occurring naturally in the body by combining with and blocking its nervous receptor. Direct-acting antagonist- which takes up space present on receptors which are otherwise taken up by neurotransmitters themselves. This results in neurotransmitters being blocked from binding to the receptors. The most common is called Atropine. Indirect-acting antagonist- drugs that inhibit the release/production of neurotransmitters (e.g., Reserpine). An antagonist drug is one that attaches (or binds) to a site called a receptor without activating that receptor to produce a biological response. It is therefore said to have no intrinsic activity. An antagonist may also be called a receptor "blocker" because they block the effect of an agonist at the site. The pharmacological effects of an antagonist therefore result in preventing the corresponding receptor site's agonists (e.g., drugs, hormones, neurotransmitters) from binding to and activating it. Antagonists may be "competitive" or "irreversible". A competitive antagonist competes with an agonist for binding to the receptor. As the concentration of antagonist increases, the binding of the agonist is progressively inhibited, resulting in a decrease in the physiological response. High concentration of an antagonist can completely inhibit the response. This inhibition can be reversed, however, by an increase of the concentration of the agonist, since the agonist and antagonist compete for binding to the receptor. Competitive antagonists, therefore, can be characterized as shifting the dose–response relationship for the agonist to the right. In the presence of a competitive antagonist, it takes an increased concentration of the agonist to produce the same response observed in the absence of the antagonist. An irreversible antagonist binds so strongly to the receptor as to render the receptor unavailable for binding to the agonist. Irreversible antagonists may even form covalent chemical bonds with the receptor. In either case, if the concentration of the irreversible antagonist is high enough, the number of unbound receptors remaining for agonist binding may be so low that even high concentrations of the agonist do not produce the maximum biological response. In humans, catecholamines and phenethylaminergic trace amines are derived from the amino acid L-phenylalanine. Diseases and disorders may also affect specific neurotransmitter systems. The following are disorders involved in either an increase, decrease, or imbalance of certain neurotransmitters. For example, problems in producing dopamine (mainly in the substantia nigra) can result in Parkinson's disease, a disorder that affects a person's ability to move as they want to, resulting in stiffness, tremors or shaking, and other symptoms. Some studies suggest that having too little or too much dopamine or problems using dopamine in the thinking and feeling regions of the brain may play a role in disorders like schizophrenia or attention deficit hyperactivity disorder (ADHD). Dopamine is also involved in addiction and drug use, as most recreational drugs cause an influx of dopamine in the brain (especially opioid and methamphetamines) that produces a pleasurable feeling, which is why users constantly crave drugs. Similarly, after some research suggested that drugs that block the recycling, or reuptake, of serotonin seemed to help some people diagnosed with depression, it was theorized that people with depression might have lower-than-normal serotonin levels. Though widely popularized, this theory was not borne out in subsequent research. Therefore, selective serotonin reuptake inhibitors (SSRIs) are used to increase the amounts of serotonin in synapses. Furthermore, problems with producing or using glutamate have been suggestively and tentatively linked to many mental disorders, including autism, obsessive compulsive disorder (OCD), schizophrenia, and depression. Having too much glutamate has been linked to neurological diseases such as Parkinson's disease, multiple sclerosis, Alzheimer's disease, stroke, and ALS (amyotrophic lateral sclerosis). Generally, there are no scientifically established "norms" for appropriate levels or "balances" of different neurotransmitters. It is in most cases pragmatically impossible to even measure levels of neurotransmitters in a brain or body at any distinct moments in time. Neurotransmitters regulate each other's release, and weak consistent imbalances in this mutual regulation were linked to temperament in healthy people . Strong imbalances or disruptions to neurotransmitter systems have been associated with many diseases and mental disorders. These include Parkinson's, depression, insomnia, Attention Deficit Hyperactivity Disorder (ADHD), anxiety, memory loss, dramatic changes in weight and addictions. Chronic physical or emotional stress can be a contributor to neurotransmitter system changes. Genetics also plays a role in neurotransmitter activities. Apart from recreational use, medications that directly and indirectly interact one or more transmitter or its receptor are commonly prescribed for psychiatric and psychological issues. Notably, drugs interacting with serotonin and norepinephrine are prescribed to patients with problems such as depression and anxiety—though the notion that there is much solid medical evidence to support such interventions has been widely criticized. Diffusion – the neurotransmitter detaches from receptor, drifting out of the synaptic cleft, here it becomes absorbed by glial cells. Enzyme degradation – special chemicals called enzymes break it down. Usually, astrocytes absorb the excess neurotransmitters and pass them on to enzymes or pump them directly into the presynaptic neuron. Reuptake – re-absorption of a neurotransmitter into the neuron. Transporters, or membrane transport proteins, pump neurotransmitters from the synaptic cleft back into axon terminals (the presynaptic neuron) where they are stored. For example, choline is taken up and recycled by the pre-synaptic neuron to synthesize more ACh. Other neurotransmitters such as dopamine are able to diffuse away from their targeted synaptic junctions and are eliminated from the body via the kidneys, or destroyed in the liver. Each neurotransmitter has very specific degradation pathways at regulatory points, which may be targeted by the body's regulatory system or by recreational drugs. ^ In the central nervous system, anandamide other endocannabinoids utilize retrograde neurotransmission, since their release is postsynaptic, while their target receptor, cannabinoid receptor 1 (CB1), is presynaptic. The cannabis plant contains Δ9-tetrahydrocannabinol, which is a direct agonist at CB1. ^ Lodish, H.; Berk, A.; Zipursky, S.L. (2000). Molecular Cell Biology: Section 21.4Neurotransmitters, Synapses, and Impulse Transmission (4th ed.). New York: W. H. Freeman. ^ Cherry, Kendra. "What is a Neurotransmitter?". Retrieved 6 October 2014. ^ "Neuropeptides. IUPHAR/BPS Guide to pharmacology". ^ "Junctions Between Cells". Retrieved 22 November 2010. ^ University, S. Marc Breedlove, Michigan State University, Neil V. Watson, Simon Fraser (2013). Biological psychology : an introduction to behavioral, cognitive, and clinical neuroscience (Seventh ed.). Sunderland, MA: Sinauer Associates. ISBN 978-0878939275. ^ a b Whishaw, Bryan Kolb, Ian Q. (2014). An introduction to brain and behavior (4th ed.). New York, NY: Worth Publishers. pp. 150–151. ISBN 978-1429242288. ^ Snyder SH, Innis RB (1979). "Peptide neurotransmitters". Annu. Rev. Biochem. 48: 755–82. doi:10.1146/annurev.bi.48.070179.003543. PMID 38738. ^ "International Symposium on Nitric Oxide – Dr. John Andrews – MaRS". MaRS. Archived from the original on 14 October 2014. ^ "Dopamine: Biological activity". IUPHAR/BPS guide to pharmacology. International Union of Basic and Clinical Pharmacology. Retrieved 29 January 2016. ^ Lin Y, Hall RA, Kuhar MJ (October 2011). "CART peptide stimulation of G protein-mediated signaling in differentiated PC12 cells: identification of PACAP 6–38 as a CART receptor antagonist". Neuropeptides. 45 (5): 351–358. doi:10.1016/j.npep.2011.07.006. PMC 3170513. PMID 21855138. ^ Whishaw, Bryan Kolb, Ian Q. (2014). An introduction to brain and behavior (4th ed.). New York, NY: Worth Publishers. ISBN 978-1429242288. ^ Gross L (2006). ""Supporting" players take the lead in protecting the overstimulated brain". PLoS Biol. 4 (11): e371. doi:10.1371/journal.pbio.0040371. PMC 1609133. PMID 20076484. ^ Yang JL, Sykora P, Wilson DM, Mattson MP, Bohr VA (August 2011). "The excitatory neurotransmitter glutamate stimulates DNA repair to increase neuronal resiliency". Mech. Ageing Dev. 132 (8–9): 405–11. doi:10.1016/j.mad.2011.06.005. PMC 3367503. PMID 21729715. 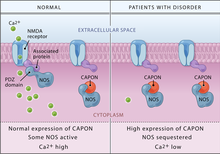 ^ Orexin receptor antagonists a new class of sleeping pill, National Sleep Foundation. ^ "Acetylcholine Receptors". Ebi.ac.uk. Retrieved 25 August 2014. ^ Schacter, Gilbert and Weger. Psychology.United States of America.2009.Print. ^ a b University of Bristol. "Introduction to Serotonin". Retrieved 15 October 2009. ^ a b c d e Miller GM (January 2011). "The emerging role of trace amine-associated receptor 1 in the functional regulation of monoamine transporters and dopaminergic activity". J. Neurochem. 116 (2): 164–176. doi:10.1111/j.1471-4159.2010.07109.x. PMC 3005101. PMID 21073468. ^ a b c d Eiden LE, Weihe E (January 2011). "VMAT2: a dynamic regulator of brain monoaminergic neuronal function interacting with drugs of abuse". Ann. N. Y. Acad. Sci. 1216: 86–98. doi:10.1111/j.1749-6632.2010.05906.x. PMC 4183197. PMID 21272013. VMAT2 is the CNS vesicular transporter for not only the biogenic amines DA, NE, EPI, 5-HT, and HIS, but likely also for the trace amines TYR, PEA, and thyronamine (THYR) ... [Trace aminergic] neurons in mammalian CNS would be identifiable as neurons expressing VMAT2 for storage, and the biosynthetic enzyme aromatic amino acid decarboxylase (AADC). ^ a b c Malenka RC, Nestler EJ, Hyman SE (2009). "Chapter 6: Widely Projecting Systems: Monoamines, Acetylcholine, and Orexin". In Sydor A, Brown RY. Molecular Neuropharmacology: A Foundation for Clinical Neuroscience (2nd ed.). New York: McGraw-Hill Medical. p. 155. ISBN 9780071481274. Different subregions of the VTA receive glutamatergic inputs from the prefrontal cortex, orexinergic inputs from the lateral hypothalamus, cholinergic and also glutamatergic and GABAergic inputs from the laterodorsal tegmental nucleus and pedunculopontine nucleus, noradrenergic inputs from the locus ceruleus, serotonergic inputs from the raphe nuclei, and GABAergic inputs from the nucleus accumbens and ventral pallidum. ^ Malenka RC, Nestler EJ, Hyman SE (2009). "Chapter 6: Widely Projecting Systems: Monoamines, Acetylcholine, and Orexin". In Sydor A, Brown RY. Molecular Neuropharmacology: A Foundation for Clinical Neuroscience (2nd ed.). New York: McGraw-Hill Medical. pp. 145, 156–157. ISBN 9780071481274. Descending NE fibers modulate afferent pain signals. ... The locus ceruleus (LC), which is located on the floor of the fourth ventricle in the rostral pons, contains more than 50% of all noradrenergic neurons in the brain; it innervates both the forebrain (eg, it provides virtually all the NE to the cerebral cortex) and regions of the brainstem and spinal cord. ... The other noradrenergic neurons in the brain occur in loose collections of cells in the brainstem, including the lateral tegmental regions. These neurons project largely within the brainstem and spinal cord. NE, along with 5HT, ACh, histamine, and orexin, is a critical regulator of the sleep-wake cycle and of levels of arousal. ... LC firing may also increase anxiety ...Stimulation of β-adrenergic receptors in the amygdala results in enhanced memory for stimuli encoded under strong negative emotion ... Epinephrine occurs in only a small number of central neurons, all located in the medulla. Epinephrine is involved in visceral functions, such as control of respiration. ^ a b c d Rang, H. P. (2003). Pharmacology. Edinburgh: Churchill Livingstone. pp. 474 for noradrenaline system, page 476 for dopamine system, page 480 for serotonin system and page 483 for cholinergic system. ISBN 978-0-443-07145-4. ^ a b c d e Iwańczuk W, Guźniczak P (2015). "Neurophysiological foundations of sleep, arousal, awareness and consciousness phenomena. Part 1". Anaesthesiol Intensive Ther. 47 (2): 162–167. doi:10.5603/AIT.2015.0015. PMID 25940332. The ascending reticular activating system (ARAS) is responsible for a sustained wakefulness state. ... The thalamic projection is dominated by cholinergic neurons originating from the pedunculopontine tegmental nucleus of pons and midbrain (PPT) and laterodorsal tegmental nucleus of pons and midbrain (LDT) nuclei [17, 18]. The hypothalamic projection involves noradrenergic neurons of the locus coeruleus (LC) and serotoninergic neurons of the dorsal and median raphe nuclei (DR), which pass through the lateral hypothalamus and reach axons of the histaminergic tubero-mamillary nucleus (TMN), together forming a pathway extending into the forebrain, cortex and hippocampus. Cortical arousal also takes advantage of dopaminergic neurons of the substantia nigra (SN), ventral tegmenti area (VTA) and the periaqueductal grey area (PAG). Fewer cholinergic neurons of the pons and midbrain send projections to the forebrain along the ventral pathway, bypassing the thalamus [19, 20]. ^ a b c d e Malenka RC, Nestler EJ, Hyman SE (2009). "Chapter 12: Sleep and Arousal". In Sydor A, Brown RY. Molecular Neuropharmacology: A Foundation for Clinical Neuroscience (2nd ed.). New York, USA: McGraw-Hill Medical. p. 295. ISBN 9780071481274. The ARAS is a complex structure consisting of several different circuits including the four monoaminergic pathways ... The norepinephrine pathway originates from the locus ceruleus (LC) and related brainstem nuclei; the serotonergic neurons originate from the raphe nuclei within the brainstem as well; the dopaminergic neurons originate in ventral tegmental area (VTA); and the histaminergic pathway originates from neurons in the tuberomammillary nucleus (TMN) of the posterior hypothalamus. As discussed in Chapter 6, these neurons project widely throughout the brain from restricted collections of cell bodies. Norepinephrine, serotonin, dopamine, and histamine have complex modulatory functions and, in general, promote wakefulness. The PT in the brain stem is also an important component of the ARAS. Activity of PT cholinergic neurons (REM-on cells) promotes REM sleep. During waking, REM-on cells are inhibited by a subset of ARAS norepinephrine and serotonin neurons called REM-off cells. ^ Rinaman L (February 2011). "Hindbrain noradrenergic A2 neurons: diverse roles in autonomic, endocrine, cognitive, and behavioral functions". American Journal of Physiology. Regulatory, Integrative and Comparative Physiology. 300 (2): R222–35. doi:10.1152/ajpregu.00556.2010. PMC 3043801. PMID 20962208. ^ Calipari ES, Bagot RC, Purushothaman I, Davidson TJ, Yorgason JT, Peña CJ, Walker DM, Pirpinias ST, Guise KG, Ramakrishnan C, Deisseroth K, Nestler EJ (February 2016). "In vivo imaging identifies temporal signature of D1 and D2 medium spiny neurons in cocaine reward". Proc. Natl. Acad. Sci. U.S.A. 113 (10): 2726–31. doi:10.1073/pnas.1521238113. PMC 4791010. PMID 26831103. Previous work has demonstrated that optogenetically stimulating D1 MSNs promotes reward, whereas stimulating D2 MSNs produces aversion. ^ Malenka RC, Nestler EJ, Hyman SE (2009). "Chapter 6: Widely Projecting Systems: Monoamines, Acetylcholine, and Orexin". In Sydor A, Brown RY. Molecular Neuropharmacology: A Foundation for Clinical Neuroscience (2nd ed.). New York: McGraw-Hill Medical. pp. 175–176. ISBN 9780071481274. Within the brain, histamine is synthesized exclusively by neurons with their cell bodies in the tuberomammillary nucleus (TMN) that lies within the posterior hypothalamus. There are approximately 64000 histaminergic neurons per side in humans. These cells project throughout the brain and spinal cord. Areas that receive especially dense projections include the cerebral cortex, hippocampus, neostriatum, nucleus accumbens, amygdala, and hypothalamus. ... While the best characterized function of the histamine system in the brain is regulation of sleep and arousal, histamine is also involved in learning and memory ...It also appears that histamine is involved in the regulation of feeding and energy balance. ^ Malenka RC, Nestler EJ, Hyman SE (2009). "Chapter 6: Widely Projecting Systems: Monoamines, Acetylcholine, and Orexin". In Sydor A, Brown RY. Molecular Neuropharmacology: A Foundation for Clinical Neuroscience (2nd ed.). New York: McGraw-Hill Medical. pp. 158–160. ISBN 9780071481274. [The] dorsal raphe preferentially innervates the cerebral cortex, thalamus, striatal regions (caudate-putamen and nucleus accumbens), and dopaminergic nuclei of the midbrain (eg, the substantia nigra and ventral tegmental area), while the median raphe innervates the hippocampus, septum, and other structures of the limbic forebrain. ... it is clear that 5HT influences sleep, arousal, attention, processing of sensory information in the cerebral cortex, and important aspects of emotion (likely including aggression) and mood regulation. ...The rostral nuclei, which include the nucleus linearis, dorsal raphe, medial raphe, and raphe pontis, innervate most of the brain, including the cerebellum. The caudal nuclei, which comprise the raphe magnus, raphe pallidus, and raphe obscuris, have more limited projections that terminate in the cerebellum, brainstem, and spinal cord. ^ Nestler, Eric J. "BRAIN REWARD PATHWAYS". Icahn School of Medicine at Mount Sinai. Nestler Lab. Retrieved 16 August 2014. The dorsal raphe is the primary site of serotonergic neurons in the brain, which, like noradrenergic neurons, pervasively modulate brain function to regulate the state of activation and mood of the organism. ^ Marston OJ, Garfield AS, Heisler LK (June 2011). "Role of central serotonin and melanocortin systems in the control of energy balance". European Journal of Pharmacology. 660 (1): 70–79. doi:10.1016/j.ejphar.2010.12.024. PMID 21216242. ^ Malenka RC, Nestler EJ, Hyman SE (2009). "Chapter 6: Widely Projecting Systems: Monoamines, Acetylcholine, and Orexin". In Sydor A, Brown RY. Molecular Neuropharmacology: A Foundation for Clinical Neuroscience (2nd ed.). New York: McGraw-Hill Medical. pp. 167–175. ISBN 9780071481274. The basal forebrain cholinergic nuclei are comprised the medial septal nucleus (Ch1), the vertical nucleus of the diagonal band (Ch2), the horizontal limb of the diagonal band (Ch3), and the nucleus basalis of Meynert (Ch4). Brainstem cholinergic nuclei include the pedunculopontine nucleus (Ch5), the laterodorsal tegmental nucleus (Ch6), the medial habenula (Ch7), and the parabigeminal nucleus (Ch8). ^ "Neuron Conversations: How Brain Cells Communicate". Brainfacts.org. Retrieved 2 December 2014. ^ a b Yadav VK, Ryu JH, Suda N, Tanaka KF, Gingrich JA, Schütz G, Glorieux FH, Chiang CY, Zajac JD, Insogna KL, Mann JJ, Hen R, Ducy P, Karsenty G (November 2008). "Lrp5 controls bone formation by inhibiting serotonin synthesis in the duodenum". Cell. 135 (5): 825–37. doi:10.1016/j.cell.2008.09.059. PMC 2614332. PMID 19041748. ^ "CDC Strychnine | Facts about Strychnine | Public Health Emergency Preparedness& Response". emergency.cdc.gov. Retrieved 7 May 2018. ^ a b c "Neurotransmitters and Drugs Chart". Ocw.mit.edu. Retrieved 25 August 2014. ^ "Agonist – Definition and More from the Free Merriam-Webster Dictionary". Merriam-webster.com. Retrieved 25 August 2014. ^ a b Richard K. Ries; David A. Fiellin; Shannon C. Miller (2009). Principles of addiction medicine (4th ed.). Philadelphia: Wolters Kluwer/Lippincott Williams & Wilkins. pp. 709–710. ISBN 9780781774772. Retrieved 16 August 2015. ^ a b c Flores A, Maldonado R, Berrendero F (2013). "Cannabinoid-hypocretin cross-talk in the central nervous system: what we know so far". Front Neurosci. 7: 256. doi:10.3389/fnins.2013.00256. PMC 3868890. PMID 24391536. ^ "Antagonist". Medical definition of Antagonist. Retrieved 5 November 2014. ^ Goeders, Nick E. (2001). "Antagonist". Encyclopedia of Drugs, Alcohol, and Addictive Behavior. Retrieved 2 December 2014. ^ a b c d e Meyers, Stephen (2000). "Use of Neurotransmitter Precursors for Treatment of Depression" (PDF). Alternative Medicine Review. 5 (1): 64–71. PMID 10696120. Archived from the original (PDF) on 5 August 2004. ^ Van Praag, HM (1981). "Management of depression with serotonin precursors". Biol Psychiatry. 16 (3): 291–310. PMID 6164407. ^ Healy, David (21 April 2015). "Serotonin and depression". BMJ. 350: h1771. doi:10.1136/bmj.h1771. ISSN 1756-1833. PMID 25900074. ^ "NIMH Brain Basics". U.S. National Institutes of Health. Retrieved 29 October 2014. ^ Bittigau, P.; Ikonomidou, C. (November 1997). "Glutamate in neurologic diseases". Journal of Child Neurology. 12 (8): 471–485. doi:10.1177/088307389701200802. ISSN 0883-0738. PMID 9430311. ^ Netter, P. (1991) Biochemical variables in the study of temperament. In Strelau, J. & Angleitner, A. (Eds. ), Explorations in temperament: International perspectives on theory and measurement 147–161. New York: Plenum Press. ^ Trofimova I, Robbins TW (2016). "Temperament and arousal systems: a new synthesis of differential psychology and functional neurochemistry". Neuroscience and Biobehavioral Reviews. 64: 382–402. doi:10.1016/j.neubiorev.2016.03.008. PMID 26969100. ^ Cloninger CR, Svrakic DM, Przybeck TR. A psychobiological model of temperament and character" Arch Gen Psychiatry 1993; 50:975-990. ^ Trofimova, IN (2016). "The interlocking between functional aspects of activities and a neurochemical model of adult temperament". In: Arnold, M.C. (Ed.) Temperaments: Individual Differences, Social and Environmental Influences and Impact on Quality of Life. New York: Nova Science Publishers, Inc.: 77–147. ^ Depue RA, Morrone-Strupinsky JV (2005). "A neurobehavioural model of affiliate bonding: implications for conceptualizing a human trait of affiliation". Behavioral and Brain Sciences. 28 (3): 313–350. doi:10.1017/s0140525x05000063. PMID 16209725. Wikimedia Commons has media related to Neurotransmitter. This page was last edited on 26 March 2019, at 05:00 (UTC).